At “Woodstock for capitalists,” Berkshire Hathaway’s annual meeting this past Sunday, Warren Buffett said that healthcare, not taxes, is the real problem facing corporate America. Since 1960, corporate taxes as a share of GDP have fallen from 4 to 2 percent, while health care costs have risen from 5 to 17 percent of GDP. The results were staggering. According to the computer model, the costs of today’s 8- to 11-year-olds being inactive and consequently overweight would be almost $3 trillion in medical expenses and lost productivity every year once the children reached adulthood and for decades until their deaths. But when the researchers tweaked children’s activity levels within their model, the numbers began to look quite different. If they presumed that, in an imaginary America, half of all children exercised vigorously for about 25 minutes three times a week, such as during active recess or sports or, more ambitiously, ran around and moved for at least an hour every day, which is the amount of youth exercise recommended by the CDC, their virtual lives were transformed. There are presently 31.7 million American children aged 8 to 11. 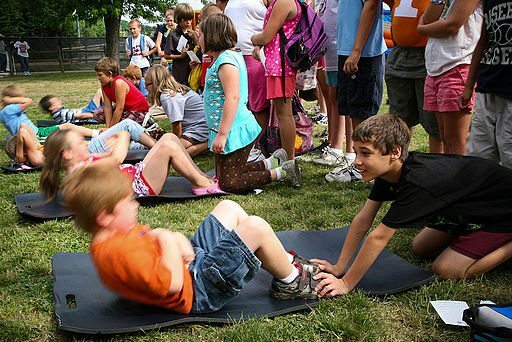 Two-thirds of these children rarely exercise. Many are overweight or obese. The computer model created an electronic avatar for every American child today growing up, changing each virtual child’s body incrementally as they grew into adulthood. As the simulated children became adults, the scientists then modeled each one’s health, based on obesity-associated risks for heart disease, diabetes, stroke and cancer, and also the probable financial price of dealing with those diseases (adjusted for future inflation), both in terms of direct expenses for hospitalizations, drugs and so on, and lost productivity because of someone’s being ill. In addition to the priceless physical and psychological benefits enjoyed by healthier living, this first-of-a-kind study indicates that if all sedentary children exercised daily, the United States could save more than $120 billion a year in health care and associated costs. Nevertheless, on the same day this startling study was published, new U.S. Agriculture Secretary Sonny Perdue announced a rollback of school lunch standards, one of Michelle Obama’s signature accomplishments as first lady and which became a lightning rod for criticism by some students and parents. On May 1st, Perdue declared that the new administration would “Make School Meals Great Again.” Obama’s “Healthy, Hunger-Free Kids Act” legislation, which authorized funding and set policy for the USDA’s core child nutrition programs, became law in 2010 and was implemented in cafeterias at the beginning of the 2012–13 school year. Obama’s “Let’s Move” campaign included better food labeling and more physical activity for children as well.